2040 Sherwood Avenue is off the market right now. Stay tuned for future opportunities or call The Hollinden Team at 502-429-3866 for more information on homes in the area. When you arrive at 2040 Sherwood Avenue, it is no surprise that this home has overgone 3.5 years’ worth of renovation. The attention to detail in this original American foursquare home is unmatched. The current owner has done an outstanding job of retaining the historic charm of this home yet adding many modern-day bells and whistles. As you enter this Highlands home, you are greeted by a spacious foyer. The foyer features original hardwood floors with cherry inlays, built-in bench seating, and an original multi-color stain glass window. The foyer is open to the living room area. The living room features original hardwood with cherry inlays, gas fireplace with mantle, granite surround and hearth, and built-in bookcases that are prewired for 5.1 surround sound. The living room flows gracefully into the kitchen, making this an ideal home for entertaining. The elegant kitchen boasts granite countertops, pendant lighting, a center breakfast island with deep sink, a planning desk, gas range and oven with stainless steel hood, and subzero side by side refrigerator. 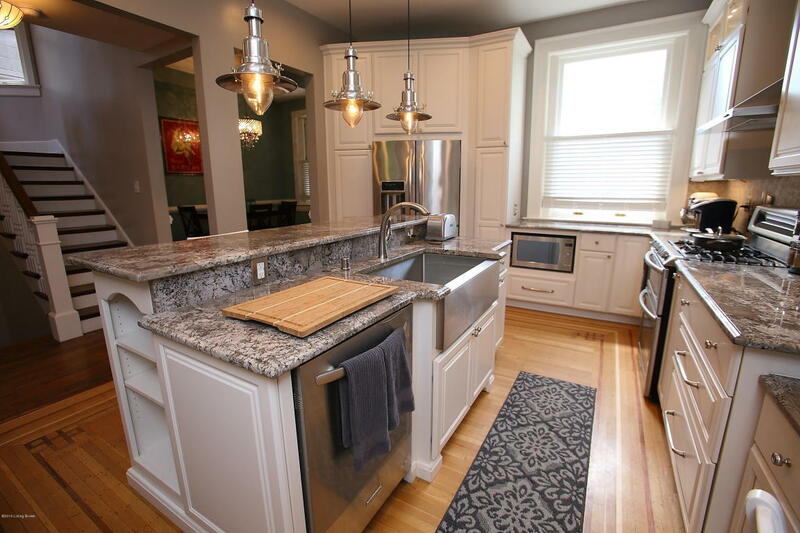 The cabinets in the kitchen are white and the granite countertops are speckled gray and white. The overall color scheme of the kitchen is neutral and gives off a clean look. To the right of the kitchen are the formal dining room and half bathroom. The formal dining room includes hardwood flooring, chandelier lighting and a door to the covered patio. Directly across from dining room is a half bathroom. The half bathroom contains a contemporary basin sink and tasteful metallic and black subway tile floor. Moving to the second floor, the steps have a large landing and natural light, perfect for growing indoor plants. The second floor features the first owner’s suite (there is a second owner’s suite on the third floor!). 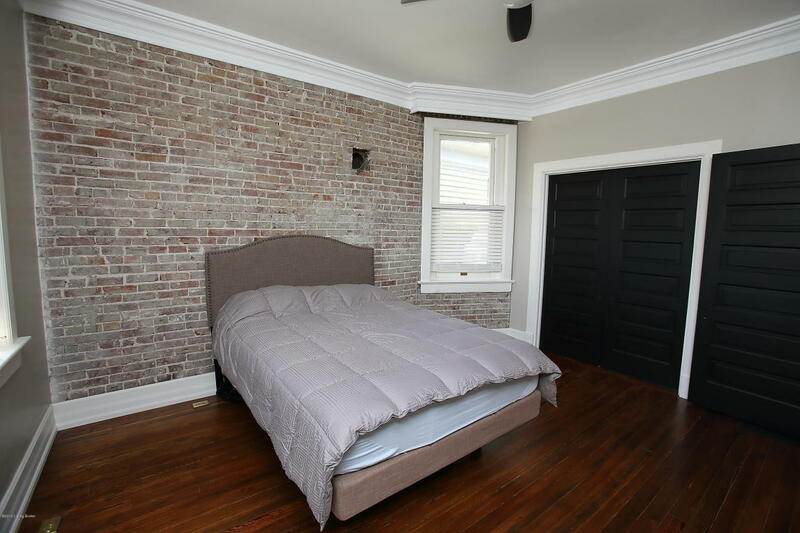 The owner’s suite has original hardwood floors, crown molding, and a gorgeous exposed brick wall that covers the back half of the wall in the bedroom. The closet in this bedroom is spacious enough to be another bedroom, providing plenty of room for more than one person to store clothing and shoes. In fact, you will notice that every closet in this home is very spacious, a rare find in the Highlands. The owner’s suite closet has hardwood flooring, exposed brick wall, and a sophisticated jeweled chandelier. The owner’s suite has an owner’s bathroom located inside the bedroom. A unique feature of the owner's bathroom is the door to the access the roof area, allowing plenty of natural light in the bathroom. This outdoor access also allows for expansion of the home. That isn’t the only distinct feature in the bathroom. The shower and tub are connected within a beautiful glass door. The shower offers several nooks for toiletries and the bathtub has a six-foot whirlpool tub with extra jets. The flooring in the owner’s suite bathroom is hardwood and the shower has ceramic tile. The second bedroom on the second floor features hardwood floors, a ceiling fan, and another beautiful brick accent wall. The full bathroom on the second floor is equally as impressive as the other bathrooms in the home. A neo-angle shower, ceramic tile, and a contemporary sink make for another incredibly designed bathroom in this home. On the third floor, you can find the SECOND owner’s suite that boasts two attic storage areas and a mini-split heating and cooling system to supplement the third level. There is a large dressing area with built-in shelves, allowing for plenty of space for storage. The bathroom features ceramic tile, privacy pocket door, custom built-in nook, glass enclosed ceramic tile shower with rain head and niche, and a six-foot whirlpool tub with extra jets. The basement is spacious and offers an office, fitness room, family room, handicap accessible full bathroom, laundry room with pedestal sink and ceramic tile, and living suite with access to the outside. The 80-gallon water heater is in the basement. The basement has the potential to be rented as an apartment. The rear yard features a five-foot gas fire pit and stone paved patio, perfect for outdoor entertaining. There is also room for expansion in the backyard. The 33x36 area in the backyard can be used for various additions such as a carriage house, garage, or an alley accessed garage with an above apartment. The space is large enough to fit a three-car garage. The outside of this home also has some additional features. There is a new 30-year roof, 6” gutters and 5” spouts (drain to the alley), 175ft French drain (supports home and future development on the property), spray foam insulation above the third floor and basement, $20k sewer lines and water lines, and a $120k geothermal system. The geothermal system is connected to three wells in the backyard that are each 150’ feet deep. The geothermal system provides a substantial reduction in energy costs. The location of this home is key. 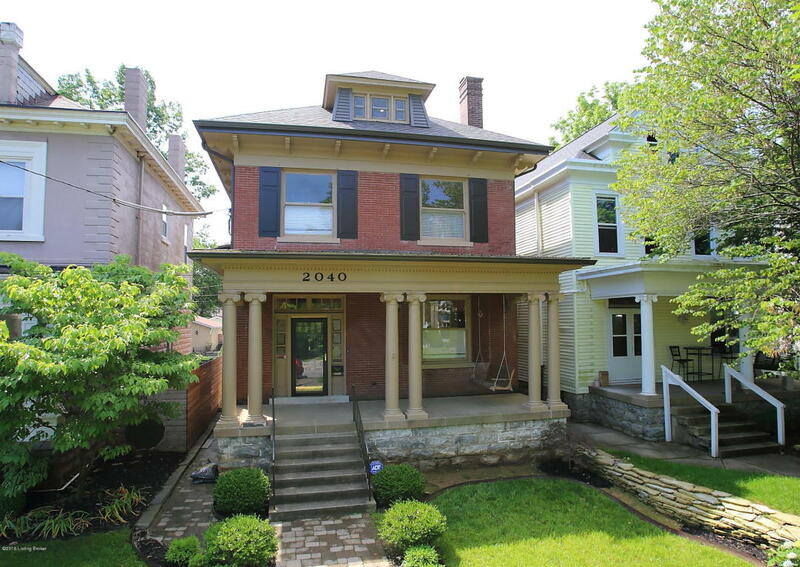 Located a block away from Cherokee Park, this home is in one of the most sought after areas of Louisville. Bardstown Road is only 500 feet away, which is far enough to not hear the traffic yet close enough to enjoy amenities. For a private tour of this exquisite home located at 2040 Sherwood Avenue located in Highlands, known as Louisville MLS 1448776, give Tim Hollinden a call at 502-429-3866. If you want to see other homes in the Highlands, The Hollinden Team can help you with that as well.